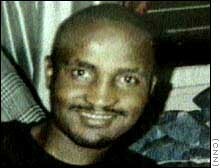 NEW YORK (CNN) -- Nearly 100 people gathered in the Bronx section of New York City Sunday to mark the second anniversary of the death of Amadou Diallo, a West African immigrant fatally shot by New York City police officers. Meeting in front of the apartment vestibule where Diallo lived and was shot, his family and friends chanted, sang songs and promised to "never forget." Diallo's father began the candlelight vigil by saying, "What happened to Amadou, we will never forget. February 4, 1999, in this vestibule, we will never forget." We will fight until there is justice for Amadou," said Rev. Al Sharpton, who helped organize the vigil. Diallo, 22, died two years ago in a hail of 41 bullets outside his Bronx apartment in what New York City officers testified was a tragic error. Diallo, who was unarmed, was hit 19 times. The officers were acquitted a year ago of state murder charges. The officers said they opened fire when it appeared Diallo pulled out a gun, which turned out to be his wallet. Last week in New York, the officials from the U.S. Department of Justice met with Sharpton and Diallo's parents and said they believed they did not have enough evidence to continue prosecution against the four officers. The police officers remain on the force and have not at this point faced any disciplinary charges. The Diallo family has sought disciplinary action against the officers, and it also has filed a $61 million civil lawsuit against the city. Bronx Borough President Ferand Ferrer and Diallo's uncle also spoke at the vigil. Diallo's mother, however, refrained from speaking to the crowd. CNN producers Maureen Madden and Lauren Brown contributed to this report.